"I originally intended to call the show, 'I’ll Millennial You in a Minute', but my promoter considered the title, 'off-puttingly baffling'. That’s my own chainsaw in the photo, by the way." Is life that bad or have we good reason to complain about it? Are we filled with righteous anger at a world gone wrong or are we all just a bunch of whiny little brats? In short, are we spoiled? Come and watch as Byrne takes this question, turns it upside down and shakes it until the funny falls out. Go on, spoil yourself. 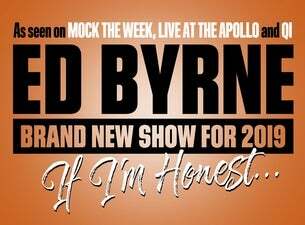 Recognised as one of the finest observational comics in the industry, Byrne's television credits are countless (provided you’re really bad at counting): Mock The Week, Have I Got News For You, The Graham Norton Show, Live At The Apollo, The One Show, Comic Relief Bake Off 2015, The World’s Most Dangerous Roads and, most recently, he and Dara O Briain filmed the follow up their Big Adventure show for BBC2 entitled Dara and Ed’s Road to Mandalay.